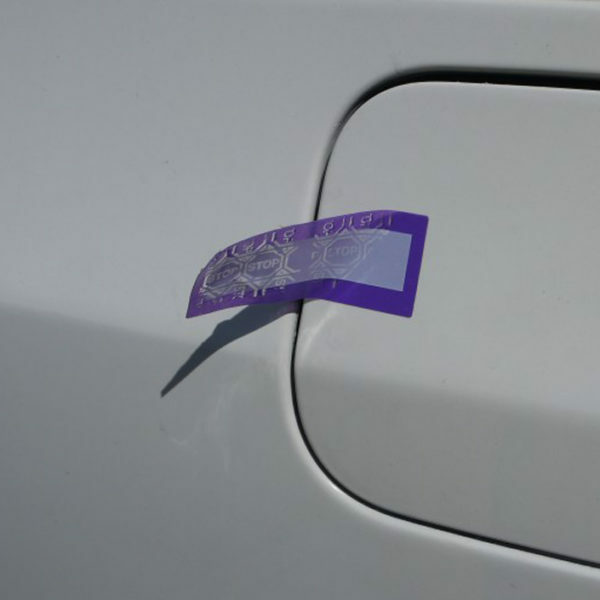 Tampertech peelable security labels are self adhesive and reveal a hidden message when peeled. Our standard options have VOID, OPENED or STOP printed in them. The non residue security seal leaves no visible mark on the surface that it has been applied to, but can not be replaced once removed due to the changes on the label surface. These labels can also by referred to as non permanent or peelable labels. The non residue security label in the image has been applied over a filler cap cover to seal a gas tank after filling at the pump, this was done before the vehicle was driven into a secure area to ensure no suspicious liquids had been added to the tank.